Plumbing and mechanical codes are revised and re-issued approximately every 3 years, which will explain some of the issues that come up in older homes when it’s time for a remodel. For instance, depending on the age of the home, current codes may dictate greater clearances for the toilet, which may mean something has to move! Codes today will have limits to the gallons-per-flush your new toilet is allowed. If, for instance, the toilet is an original 1950’s era fixture, it’s probably a 3.5-gallon flush model, which is not code compliant. A 1.5-gallon flushing toilet is now standard, and your water bill will thank you for the change. Other bathroom age-related issues are the pipes and fixtures. Things wear out, and the rate of wear depends also on the number of residents using them. New vanities, more efficient toilets, showers/tubs and faucets can be replaced, as long as they are the same size as the fixtures being replaced. Otherwise, adjustments have to be made to provide the proper clearances. However, the older the home the more complicated – and expensive – the job gets. Homes built before 1950 probably have galvanized supply lines that have completed their useful life. They should be replaced with copper or PEX. The wiring may need updating and there may or may not be an exhaust fan. An older home could have been subjected to moisture damage in the bathroom at some time, and so the walls and floor should be inspected for rot. 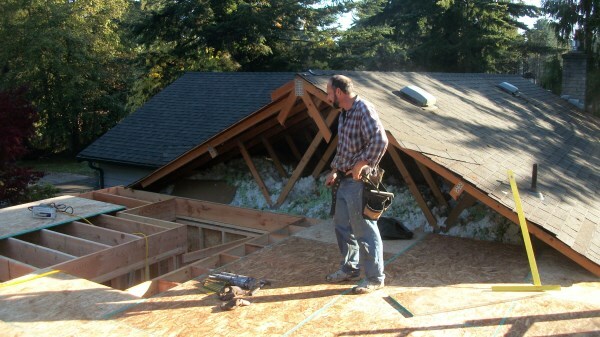 With a vintage home, a full gut job is the best solution for an upgrade. This allows for a full inspection of the supply pipes and the drain, waste and vent system. An added bonus to gutting the bath is that it provides the option of completely reconfiguring the room. The options are almost endless: Jetted tub, separate water closet, separate tub and shower, double bowl vanity, makeup area. Or, if your aims are simple, a bathroom makeover with all new fixtures, tile flooring, fresh paint and a whisper-quiet exhaust fan will do wonders for your morale, every time you step in the bathroom! What about that garage? Could it be made into a hobby room? Are you frustrated because there’s not enough room in your house? Do you glare enviously at your car which sits unaware in it’s protected space? You are not alone. 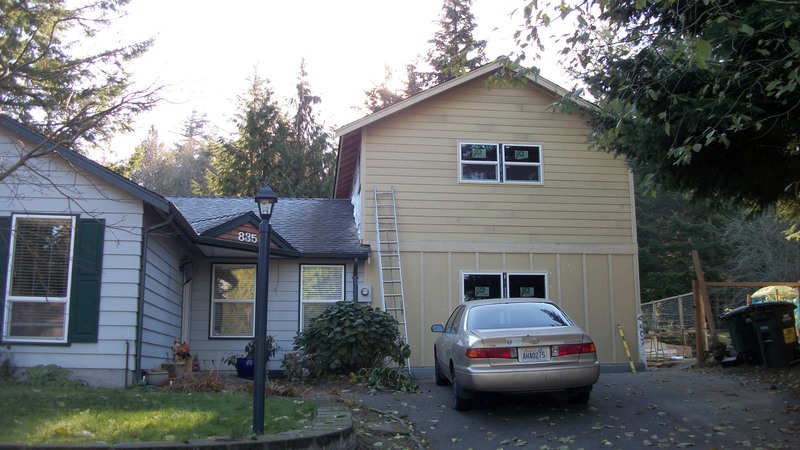 We have remodeled client’s garages, turning them into family rooms, bedrooms and an incorporating a bathroom; sometimes even adding a second floor above the garage. What could you use that square footage for? Studio, home office, master bedroom, a bedroom to separate two squabbling siblings, a game room? Or maybe you would just like to refinish that ugly stained concrete floor and build in some nice looking storage. The list is endless! Give us a call, we can do that for you! Repurposed garage for family room. 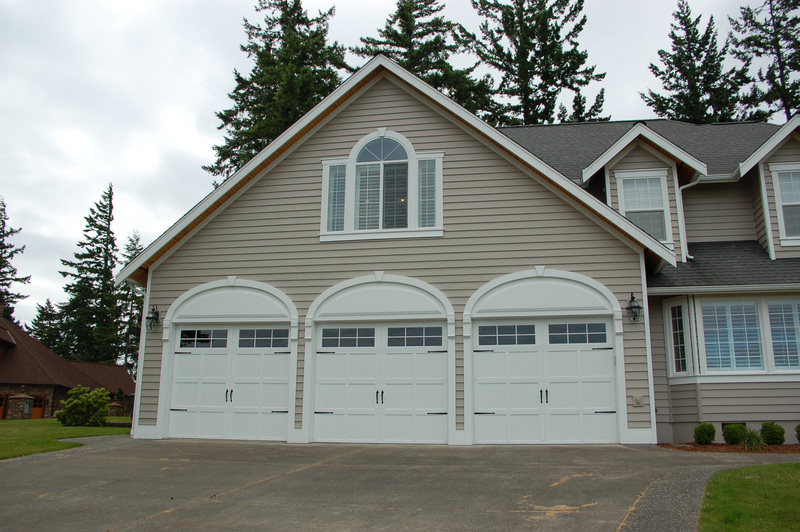 Custom garage doors, designed to match the style of the home’s windows. 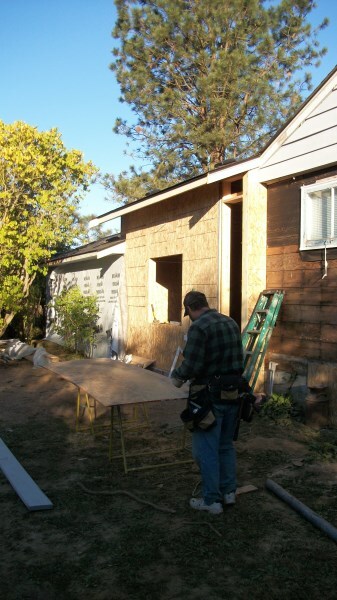 What is the cost per square foot for my remodel? Uh, oh! This is a loaded question to a home remodeler. Cost per square foot is impossible to calculate before the layout of the room(s), quality of materials, fixtures and appliances are settled on. Just selecting a certain price range of kitchen appliances can change the project cost significantly. It makes more sense to focus on the cost to construct in discussions. This can be revised based on the clients personal choices, complexity of the remodel, etc. Perhaps a more important number to use is the clients budget, minimum to maximum amounts. 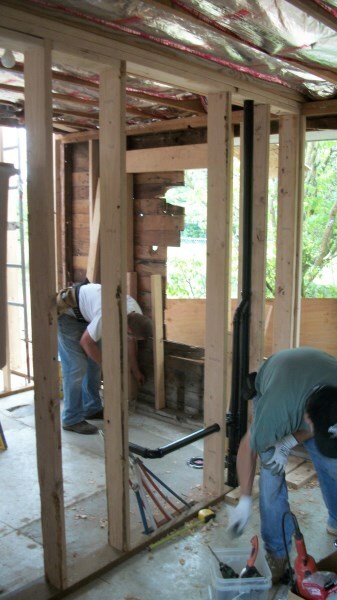 Then the remodeler can show the client what is available in materials to meet their budget constraints. During the design phase, for instance, a more expensive granite countertop could be replace by a clients wish for a high quality gas stove. There are numerous trade-offs, and a good experienced contractor will know what less expensive material will look as good as the clients first choice product. 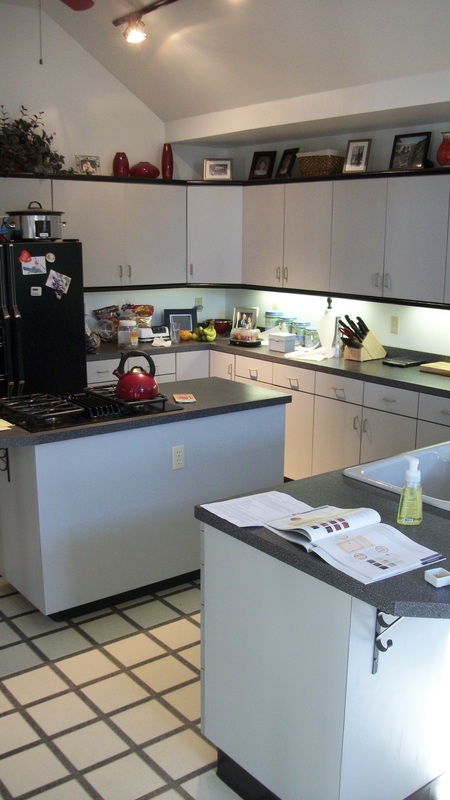 Before remodel, this kitchen was chaotic and poorly laid out; not all cabinets had doors. After the remodel, it presents a pleasant, light, organized work space. Make it one of your news year resolutions to remodel the kitchen to include proper storage room! One can gradually get used to having full cupboards that are never opened; with items that you use daily all piled on the countertop. After a while you might not “see” the mess, but when preparing dinner, it can be very annoying to have to move things aside so there is a little bit of cramped room to work. Don’t put up with it anymore! 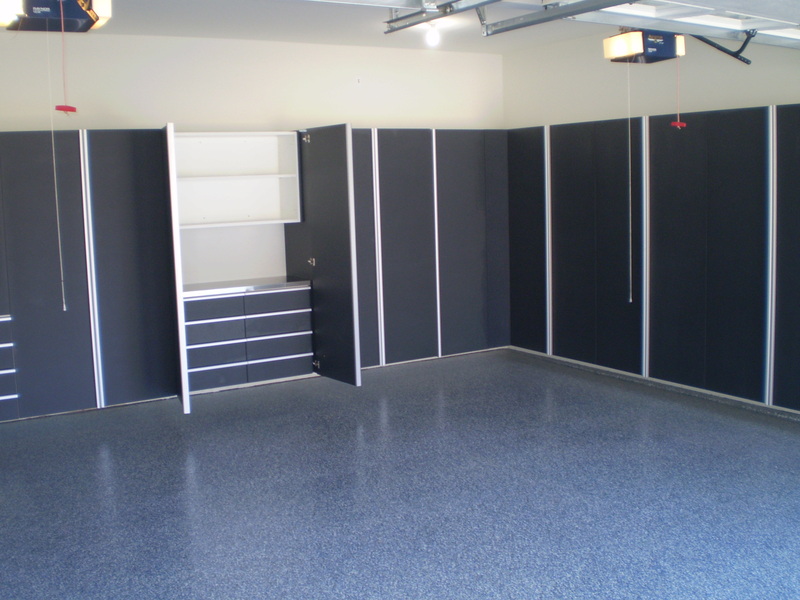 Custom cabinets can be designed and configured to make your space workable. 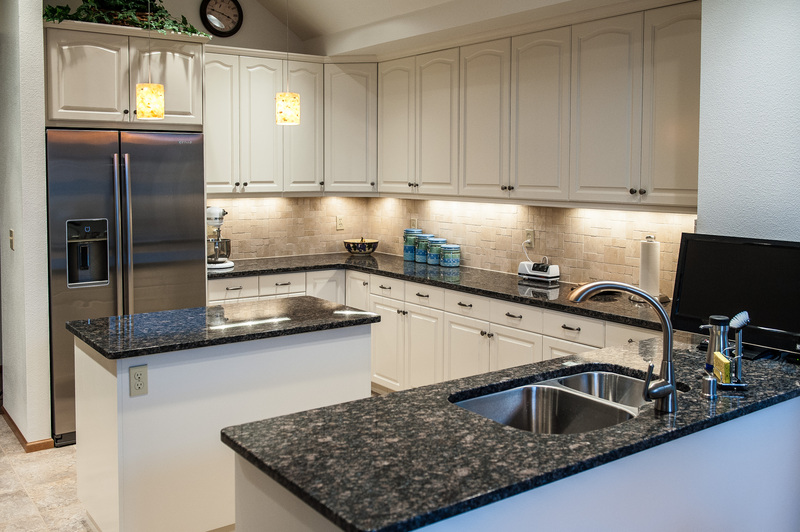 Most homes are built with standard, generic cabinets that are not made to fit every home, and so may have odd corners and gaps, showing poor planning for storage of kitchen appliances and tools. 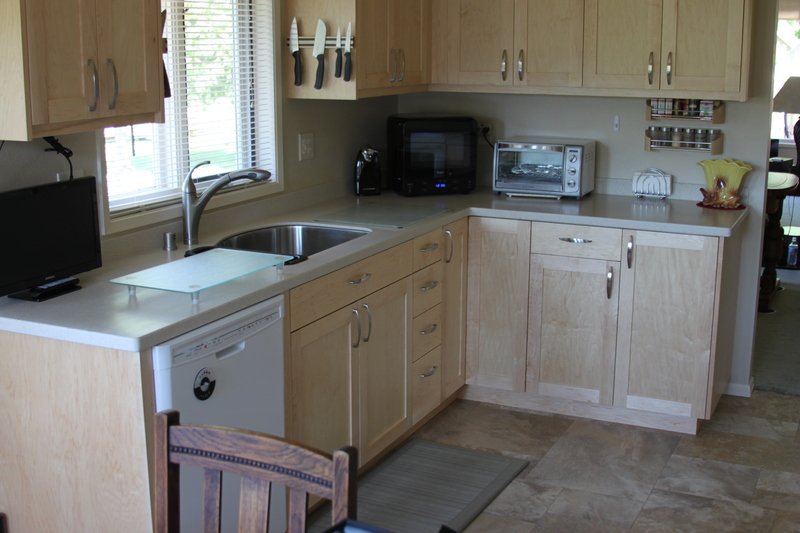 Loads of storage in this remodeled Bellingham kitchen! 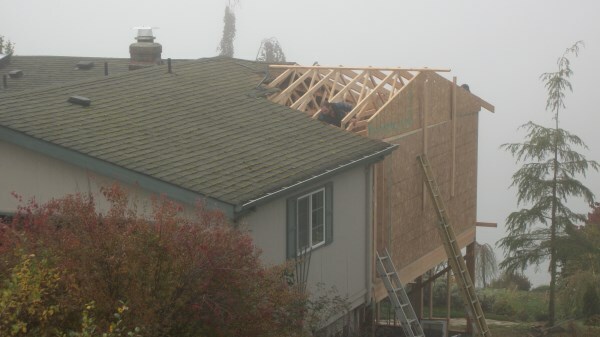 Working on the second floor addition! Lots of 2nd floor additions this year; going up, not out! 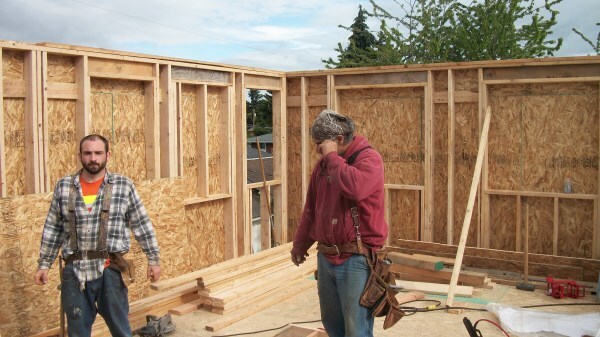 Tony & Marshall caught between tasks on a Bellingham home addition. Marshall, working hard on a foundation. 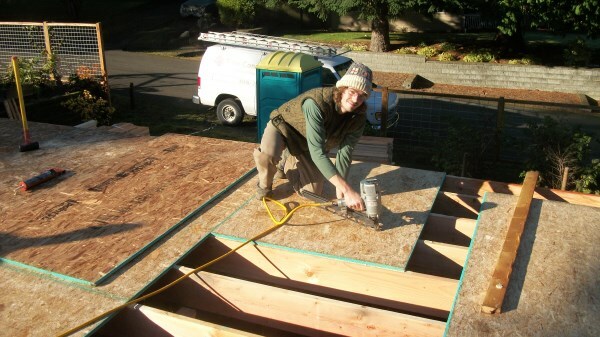 Here is a collection of photos of our skilled carpenters at work, at various homes around Whatcom county and Bellingham. They do a great job, so you can enjoy your home for many more years to come! Hey! We got snow! Awesome! Our skiers, snowboarders and snowshoers are happy. But . . . how is your deck? We don’t often get a lot of snow here in town, but when we do, it is wet, heavy snow. Is your deck up to handling it? It might be time for an inspection. 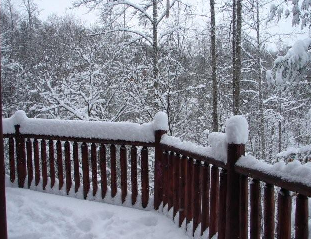 A snow-covered or icy deck is hazardous, and you want sturdy handrails for support. Check for warped boards, rot, loose handrails and poor connections. If your deck is old, it may need work, just for maintenance. An inspection can give you peace of mind. 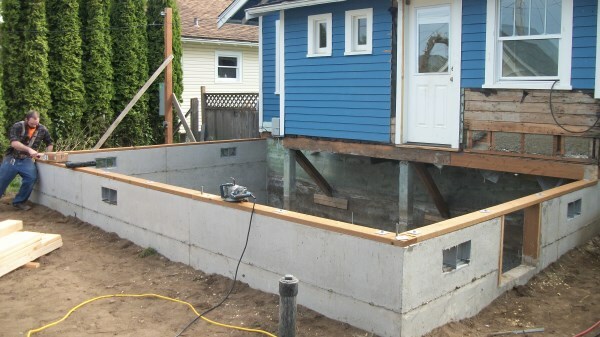 We have replaced many decks in Whatcom County and have repaired decks that were sinking due to ground subsidence. If you think your deck may be in need of inspection, repair or replacement, we are experienced in deck design and construction and would be happy to inspect, repair or replace your deck. A majority of our kitchen remodels do not move walls or add-on to a home; the majority remodel within the existing space. This is far less expensive than adding on or moving walls. Some of our customers have had interior walls removed, to open up the kitchen, to include the living room or dining room within the visual space of the kitchen. This makes the kitchen seem larger and allows the cook to converse with family and guests. A well designed custom cabinet layout can add incredible storage capacity and style to a box-store, inexpensive brand setup. Stainless steel sinks, matching refrigerator and stove, and new faucets along with a new countertop will make you think you’ve moved into a completely new home! 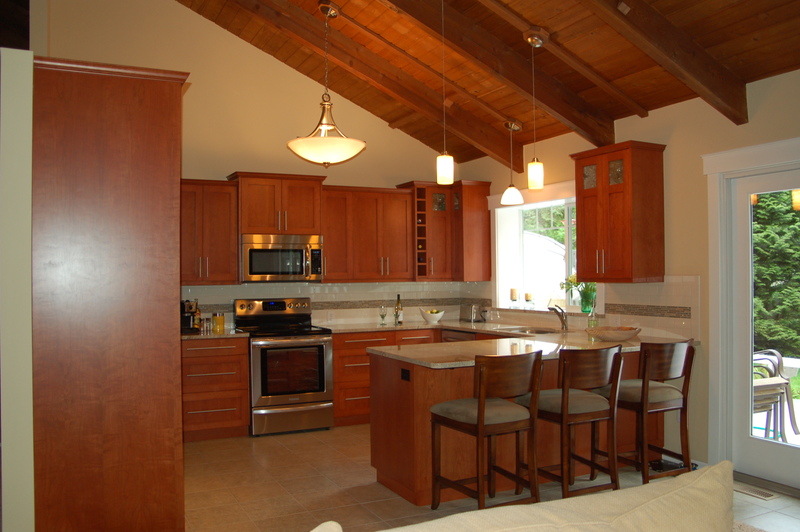 Stove is in the island; cabinets do not go all the way to the soffit; cabinets are of a uniform, monotonous quality. Stove has been moved from the island; cabinets go all the way to the soffit, utilizing all available space.